Description: Side view of 4136 at the passenger station in Kitchener, Ontario. 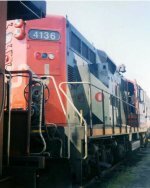 Description: CN 4136 returns to the engine siding at the passenger station in Kitchener, Ontario. Description: A pair of GP9RM's heading east with a local freight on the main line west of Brighton, Ontario. I photographed CN 4136 in 1992. She is still on the move.